A name sign is a personal sign assigned to deaf, hearing impaired and hearing persons who enter the deaf community. The mouth action accompanying the sign reproduces all or part of the formal first name that the person has received by baptism or naming. Name signs can be compared to nicknames in spoken languages, where a person working as a blacksmith by his friends might be referred to as ‘The Blacksmith’ (‘Here comes the Blacksmith!’) instead of using the person’s first name. Name signs are found not only in Danish Sign Language (DSL) but in most, if not all, sign languages studied to date. It varies greatly when – and by whom – a person gets her/his name sign, and it depends on one’s association to the deaf community. A name sign is given either by the person’s parents or by one in her/his circle of friends (educator, colleague or friend). Some people get their name sign from birth. Others get it when they start in daycare or school. Again others get their name sign later in life, if their hearing loss has occurred later, and they have not previously been associated with the deaf community. A person can also get a name sign if she/he has been linked to the deaf community through her/his professional life. Most people keep their name sign for the rest of their lives, although there are also some who, for different reasons, may change their name sign during their life. This can for example be due to the fact that the first name sign a person got characterized something by that person when she/he was a child and therefore does not fit the person as an adult. When presenting yourself to someone for the first time, you use your name sign and then spell your first name with the manual alphabet. When two people talk about a third person who is known to both of them but who is not present, the person is referred to by using the person’s name sign. In DSL, name signs can be formed in at least six different ways. They are described in McGregor, Niemelä & Bakken Jepsen (2015), on which the following review is based. (1) Manual letter name signs. In most cases, this type of name sign consists of the manual letter corresponding to the first letter of the person’s first name. In some cases, a motion element is added in the articulation of the manual letter. 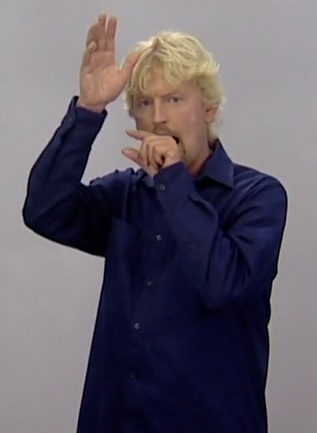 For example, the movement may be repeated short down-up movements, or the hand can be moved from side to side. Sometimes it is the first two letters of the person’s first name, performed manually, in which case no further hand movements are involved. Or the first and last letters of the person’s first name can be articulated manually. (2) Number name signs. During one period in the Danish deaf history, when deaf children were sent to boarding schools for deaf, the manual sign for a student’s school registration number was sometimes used as her/his personal name sign. The number sign was used with the addition of a side-to-side movement (Picture 1) or in combination with the manual sign of the first letter of the person’s first name. 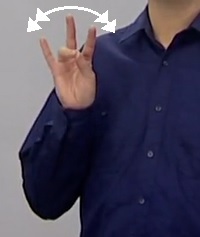 A number sign could also be used with the person’s first name, expressed with the Mouth-Hand-System. Very briefly, the Mouth-Hand-System is a manual system based on fourteen different handshapes, representing the sounds that cannot be lip-read on the basis of the movements of the mouth. (3) Characteristic name sign. This type of name sign identifies an individual characteristic of the person. It may be a physical characteristic, a way of being, a particular interest, the job or work activity of the person or the like. Examples include: A person with clear dimples got the name sign PRIK-PÅ-KIND ‘point-on-cheek’; a person who, as a child, was known to ride the bicykle a lot, was given the name sign CYKEL ‘bicycle’ (Picture 2); a person born in August, and who also has a strong personality, was given the name sign LØVE ‘lion’ (sign of the Zodiac). Name signs of this type can also be accompanied by the manual sign for the first letter of the person’s first name. For example, a person whose first name starts with ‘M’ was given the name sign ‘M handshape performed on the left side of the chest‘ because the person, as a child, used the type of hearing aids that had a battery box, and the person carried this box in his shirt pocket. (4) Surname name sign. In some cases, a part of the person’s surname is used as the basis for the formation of her/his name sign. For example, one whose surname is ‘Graversen’, was given the name sign GRAVE ‘to dig’, using the first part of the surname. (5) Rebus name. This type of name is composed of translations of words from Danish to DSL. The words are orthographically close to (parts of) the person’s first name. For example, the name Jakob may be composed of the DSL signs for JA ‘yes’ and KOP ‘cup’. (6) Folklore name signs. Some name signs are manual representations of Danish names from the folklore. The name signs are a translation into DSL of a Danish lexeme that is phonemically identical or close to the person’s first name. Examples include the name signs of the personal names Mikkel and Morten, which are performed as the signs for RÆV ‘fox’ and HARE ‘hare’ respectively. The name signs are based on the similarity of the first word in Mikkel Ræv and Morten Hare, and from there the connection to the sign RÆV ‘fox’ and HARE ‘hare’ is created. Another example is the girl’s name Hanne, which becomes HANE ‘rooster’ (Picture 3). Danish Sign Language is an independent language with its own grammar, which is different from the grammar of Danish. The language is about 200 years old and emerged with the establishment of the first Danish school for deaf in 1807. This article has provided examples of the creativity of the users of Danish Sign Language, including some of the processes in the use of metaphors, visual motivation and influence from Danish when name signs are created. McGregor, William B., Janne Boye Niemelä, and Julie Bakken Jepsen. 2015. “Danish Sign Language.” In Sign Languages of the World. A Comparative Handbook, edited by Julie Bakken Jepsen, Goedele De Clerck, Sam Lutalo-Kiingi and William B. McGregor. Hamburg: De Gruyter Mouton. Photos from Ordbog Over Dansk Tegnsprog – www.tegnsprog.dk – are used with permission.